Deer hunting is one of those endeavors that require a tremendous amount of patience. Often times preparations can stretch back a year or more. Cultivating vegetation that tends to attract deer to a particular area can be an art in and of itself. While making your hunting ground more fruitful can obviously take time as plants don’t grow overnight, but there are some things you can do even just a few weeks out that can improve the chances of drawing in bucks. 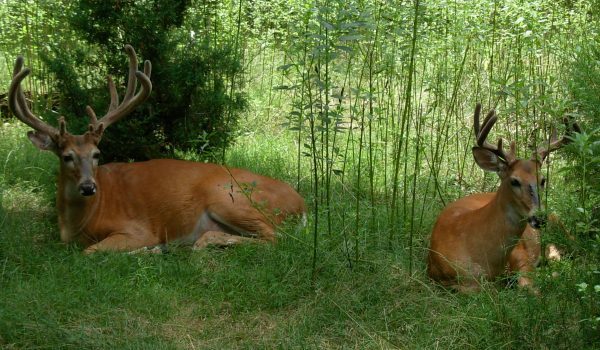 Here are four ways to attract more deer to your tree stand. Setting up a deer feeder is perhaps the most straight-forward thing you can do to attract deer. Make sense. You want to bring in deer, put out food. The trick is making the deer comfortable with the feeder and later your own presence near that feeder. For this reason you want to set your feeder out as early as possible but even just a few weeks before your hunt is a good idea. You might want to put up that tree stand nearby while you’re at it as well. Another simple way to improve the shrubs and ground cover that deer like to eat is to simply make the ground more cohesive to vegetation. Just like you would in your front yard, first clear the ground of leaves and obstructions. Don’t bother with the big stuff. Then spread a fertilizer down. The soil in forests is often too acidic for good plant growth so also add some lime to the soil at this time. Now we’re getting into the more proactive steps. Along with fortifying the soil, you should also think about sunlight. Opening up the canopy by cutting down a few trees may be a step that pays off in heavy dividends next time its deer hunting season. When you have healthier shrubs and low lying trees deer are also more prone to bed down and make the area home. Once you’ve done all of these things, another step is to plant or seed the area. Consider planting clover or peas, but don’t do so too early as deer can grub through those in a matter of weeks.